Maybe you have never heard of it. Olivine is a stone widely found in nature and therefore is not highly commented or valued. However, this stone contains numerous benefits that can help you. Get to know the properties of olivine in this article. Olivine is a crystal that makes up a group not very rare in nature that geologists call peridot. 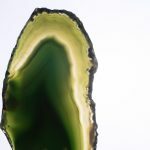 This crystal is formed by traces of magnesium and iron, having a very bright olive green coloration. It is considered the jewel of volcanoes because it is in the volcanic sediments that it forms and by its unique color and beauty. As its presence in nature is abundant, it is very easy to find and buy it. For people who do not know much, this fact may mean that this crystal is not important, but it is just the opposite. Olivine possesses many therapeutic properties of value and people attached to mysticism see it as a stabilizing stone of energies. This stability comes from the purification of negative vibrations and so it is very used at the beginning of some mystical ritual. The harmonization of the environment by olivine in turn helps in spiritual elevation and the search for self-knowledge. In addition to facilitating meditation and the encounter with peace. In this way, we can regard the olivine as a balance crystal, which only does good to the body, mind and soul. The therapeutic effects of olivine are really precious. It can transmute the energy of people and environments, causing a sense of calm and peace. By these properties, it is ideal for assisting anxiety treatments and psychological disorders such as panic syndrome and other phobias, for example. In addition to the mental effects, olivine also affects our body positively. This crystal acts in the regeneration of cells, consequently in the renewal and recomposition of various organ of the human body, such as the lungs, kidneys and liver. Coupled with the medication prescribed by the doctor for some illness that is reaching you, olivine is an excellent aid to this fragile moment. We already know that olivine acts a lot in bringing calm to our mind and also in harmonizing environments. If your intention is to harmonize your house and the members of your family, we recommend that the stone is placed in a high place, difficult to access. This so that there is no manipulation of the stone by the people, because it works better “alone”. The ideal position to leave your olivine is the central one in the environment. If this is not possible, try to leave it as close to the center as possible. If your intention is to harmonize your own energies to achieve inner peace, you can use olivine in the form of jewelry. It is best that it is in contact with your body in the form of necklaces, bracelets, earrings etc. than carrying it in a cloth bag inside your bag. Because it is considered a stone that stimulates the mind wisely, olivine is often related to the sign of Libra. Despite the affinity with this sign, all other signs of the zodiac can use and benefit from it. Remember to put together the best thoughts and intentions when manipulating an olivine stone, as well as in any mystical ritual.